The mass shooting at Marjory Stoneman Douglas High School in Parkdale, Florida has sparked a renewed debate on gun control in the United States, as survivors of the shooting that occured on Valentine’s Day are taking matters into their own hands. We’ve heard this narrative before, but this time, there’s a shift in the discourse. Over the last week, several Republicans have changed their stances on gun control, some breaking with the NRA. Even President Donald Trump, who has been extremely supportive of the NRA in the past, has expressed a desire to create change through banning bump stocks and expressing an openness to expanded background checks. Whether that openness will translate into action remains to be seen. The cycle of gun violence in the US is nothing new. So how did a bunch of teenagers start to move the needle on gun control? What’s different this time around? Almost six years ago, a 20-year-old man walked into Sandy Hook Elementary School in Newtown, Connecticut, and fatally shot 20 school children, along with 6 adult staff members before committing suicide on the premises. It was the deadliest mass shooting at either a high school or grade school and remains the fourth-deadliest mass shooting by a single person in US history. If there was any time for change in the gun control discourse, it would had been immediately following the effects of Sandy Hook. Parents of Sandy Hook Elementary came together with President Barack Obama to call for legislation on the ban of assault rifles and expanding background checks on gun purchases, both of which ultimately failed. Since 2013, sources have identified 290 school shootings in the US. Parkdale marks the sixth one just this year. This means the generation of teenagers who’ve been attending high school in the 2010s, are a generation that has grown up with mass shootings. 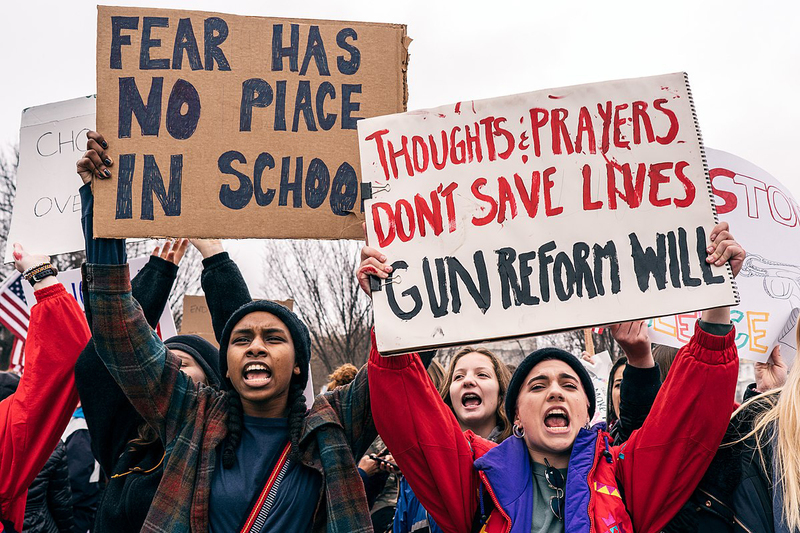 Perhaps high school students, the ones experiencing first hand the negative effects of lax gun laws and regulations such as the “gun show loophole” and therefore have the most right to demand actionable policies. Combined with newfound allies in influential organizations such as prestigious colleges or major corporations, what might’ve been a one-time protest has become a legitimate social movement as other aspects of society become engaged. Last Tuesday, Needville Independent School District superintendent Curtis Rhodes wrote in a letter to families that students would face a three-day, out-of-school suspension if they participated in any of the nationwide walkouts or protests planned in the aftermath of the Parkdale shooting. However, a number of US colleges were quick to respond to this threat, assuring students that they would not be penalized for their participation of protesting for gun control. Dozens of U.S. colleges and universities, including Ivy League universities Yale and Dartmouth, have expressed their support for prospective students taking civic action. Other channels of institutional backing include corporate support, as airlines Delta and United have stopped offering NRA members discounted rates and have asked the NRA to remove their information from their website. The journey to meaningful gun control legislation is still a long one, but to make sure we get there, organizers and students are coordinating a nationwide protest on March 24, March For Our Lives. Up to 500,000 individuals are expected in Washington, DC, with more than 50 “sister marches” across the US. Organizers of the protests are hoping for small steps, starting with closing the gun show loop, banning bump stocks and high-capacity magazines, and extended background checks. This isn’t the first time we’ve seen a push for gun reform post-tragedy, but as we watch the sea of impassioned adolescents ready to do what adults have long failed to, something feels different.